(1) Nârada Muni said [to Yudhishthhira]: 'Having heard his explanations, all the attending Daitya sons accepted his words because of their profundity and rejected what their teachers had taught them. (2) When the two sons of the guru [S'ukrâcârya's sons Shanda and Amarka] realized how the intelligence [of the boys] had gotten fixed on this one subject matter, they fearfully contacted the king to submit to him what was going on. (3-4) All over his body trembling with anger and with a mind determined to kill his son, he rebuked Prahlâda. With the harshest words he furiously with an angry face and crooked, wicked eyes, approached him who did not deserve such a treatment at all. He [from his side] gentle and restrained, just stood there with his hands folded before his father who was hissing like a vicious snake trampled upon. (19-22) As he was contemplating the miracle that took place in front of him, the extraordinary, most frightening form of Nrisimhadeva appeared. He had eyes glowing like molten gold and deadly teeth in a face extending into manes. Looking around with a dreadful frown, He waved His tongue like a razor sharp sword. His ears stood motionless straight up and His nostrils and mouth were opened wide like mountain caves. His huge body was short and fat with a broad neck and a broad chest over a small waist. His body was covered with whitish hairs resembling the rays of the moon and hundreds of arms, stretched in all directions, were equipped with hard to challenge fatal nails that served as weapons, next to His other personal weapons. Faced with that excellence the Daityas and Dânavas fled away. (23) Hiranyakas'ipu murmured to himself: 'I guess this is what the Lord so full of mystical potency is trying to do in order to get me killed, but what's the use?' and thus taking up his mace, the Daitya threw himself forward like an elephant to attack the loudly roaring Lord Nrisimha. (24) As invisible as an insect that has fallen into a fire, the Asura disappeared in the effulgence of Nrisimha. It was not so astonishing that moment, considering the fact that He formerly, by the effulgence of His goodness, had swallowed the darkness [of the entire creation]. (25) The greatest of the demons reaching Lord Nrisimha, thereupon furiously, with great force exercising his prowess, struck Him with his club. But the Lord, the Wielder of the Club, seized him like the son of Târkshya [Garuda] would capture a great snake. (26) Oh son of Bharata, when He, in order to play a game, allowed the Asura to slip from His hands, exactly the way Garuda sometimes deals with a snake, the godly souls of the different worlds, who were driven from their positions, from behind the clouds considered that a bad turn of events. (27) The demon, thinking that He had let him go out of fear for his display of power, after regaining his strength, took up his sword and shield and with great force again attacked Nrisimhadeva. (28) When he, with his moon spotted shield and sword, as fast as a hawk was maneuvering up and down, so as not to offer any opportunity, the Lord made a very shrill, loud sound of laughter that was so frightening that he, with his eyes [for a moment] closed, was captured by the Greatest of all Speed. (29) In protest he with his limbs wrestling tried to escape, but the Lord placed him, whose skin could not even be cut by Indra's thunderbolt, at the entrance of the palace on His lap like he was a snake or mouse and pierced him with His nails as easy as Garuda pierces a poisonous viper. (30) With His most fearful eyes full of anger He was difficult to behold. With His mouth wide open licking the edges with His tongue and with His mane and face smeared red with traces of blood, He wore the intestines like a garland around His neck and looked like a lion that just has killed an elephant. (31) The heart He with His pointed nails had ripped out completely and thrown aside and the thousands of followers, who with their raised weapons attended to their leader, He all killed using His nails and the other weapons in His countless hands. (32) Shaking His manes He scattered the clouds and with His glaring glance He outshone the luminaries. The waters and oceans, struck by His breathing, swirled in perturbation and afraid of His roar the elephants guarding the quarters [of the universe] cried. (33) With Him tossing His hair, the celestial chariots crowding in the sky were shoved from their places, the earth shook under the heavy weight of His feet, His intolerable force moved the mountains and hills and His effulgence outshone everything else in all directions of the sky. (34) Thereafter sitting in the assembly hall on the highest seat of man with a most fearsome, terrible countenance, there was no one to challenge Him nor anyone to worship Him. (35) But upon hearing how he, the Daitya who was the headache of the three worlds, in the battle had been killed by the Lord, there were exclamations of joy, blossoming faces and endless showers of flowers from the wives of the demigods. (36) At that time there was an overcast formed by all the celestial chariots of the demigods desirous to attend. Drums and kettle drums were sounded and the greatest singers and angels of heaven sang and danced. (37-39) All the godly souls, Brahmâ, Indra and S'iva, the sages, the ancestors, the perfected souls, the scientific experts and the great serpents [great egos] assembled there. The founding fathers, the leaders of mankind, the residents of heaven and the best of the angels arrived there too, as did the venerable souls, the keepers of the wealth and the monkey-like, oh my best one. Also the goblins came, the souls of superpower as also they who were Vishnu's personal associates, like Sunanda and Kumuda. With their hands folded before their heads to offer their obeisances, each of them approached Him who had appeared as half a man, half a lion and now sat there on the throne displaying His effulgence. (44) The ancestors [the Pitris] said: 'Of the demon who, engaging with force, enjoyed our s'râddha sacrifices that were offered by our sons and grandsons, of him who, even at the holy bathing places, drank from our offerings of sesame water, You [now] pierced the intestines of his belly with the nails of Your hand and thus have these offerings [finally] reached their proper destination. We offer Him our obeisances, He, the maintainer of the universal principles of religion who appeared as a man-lion. Third revised edition, loaded February 15, 2019. Nârada Muni said [to Yudhishthhira]: 'Having heard his explanations, all the attending Daitya sons accepted his words because of their profundity and rejected what their teachers had taught them. When the two sons of the guru [S'ukrâcârya's sons Shanda and Amarka] realized how the intelligence [of the boys] had gotten fixed on this one subject matter, they fearfully contacted the king to submit to him what was going on. All over his body trembling with anger and with a mind determined to kill his son, he rebuked Prahlâda. With the harshest words he furiously with an angry face and crooked, wicked eyes, approached him who did not deserve such a treatment at all. He [from his side] gentle and restrained, just stood there with his hands folded before his father who was hissing like a vicious snake trampled upon. Hiranyakas'ipu said: 'Oh you impudent fool, you intriguer of the family, you outcaste, you so obstinate going against my rule, today I will send you to the abode of Yamarâja! When I am angry all inhabitants of the three worlds and their leaders tremble for me. By what power do you so fearlessly overstep my rule, you rascal?' [compare B.G. 9: 31]. Prahlâda said: 'He is not only my strength but also yours, oh King, as also the strength of all other exalted and lower living beings. All beings moving around and who do not move around, beginning with Lord Brahmâ, fall under His control. Please give up your Asura way. Be of an equal mind with the soul and create no enemies. Destroy only the enemy that is an uncontrolled mind. That approach constitutes the best method to worship the unlimited Lord. S'rî Hiranyakas'ipu said: 'You apparently, with your unlimited pretenses, seek your own demise. You prove that people about to die talk gibberish, you pitiful idiot! You unlucky soul, you talk of someone other than me who would be the controller of the universe, but where is He to be found? If He is omnipresent, then why do I not see Him in this pillar right in front of me [see also B.G. 7: 25]? Thus with a stream of abuses enraged chastising that great devotee, his son, Hiranyakas'ipu, who rose from his throne and took up his sword, with his fist struck hard against a column. That very moment from within the column a most fearful sound could be heard, as if the covering of the universe cracked open. That sound, dear King, reached as far as the place of the godly souls of Lord Brahmâ and made them believe the destruction of their abodes was at hand. He who in his display of power wanted to kill his son, also heard the tumultuous sound one had never heard before. Together with the assembly present he stood amazed about the fact that one could not determine its origin. Thus all these men of power were beset by fear. To be true to the words that were spoken in defense of His omnipresence, of His pervading each and everything, one could see a most wonderful form of Him taking shape in a pillar in the middle of the assembly hall. It was neither an animal nor a man. As he was contemplating the miracle that took place in front of him, the extraordinary, most frightening form of Nrisimhadeva appeared. He had eyes glowing like molten gold and deadly teeth in a face extending into manes. Looking around with a dreadful frown, He waved His tongue like a razor sharp sword. His ears stood motionless straight up and His nostrils and mouth were opened wide like mountain caves. His huge body was short and fat with a broad neck and a broad chest over a small waist. His body was covered with whitish hairs resembling the rays of the moon and hundreds of arms, stretched in all directions, were equipped with hard to challenge fatal nails that served as weapons, next to His other personal weapons. Faced with that excellence the Daityas and Dânavas fled away. Hiranyakas'ipu murmured to himself: 'I guess this is what the Lord so full of mystical potency is trying to do in order to get me killed, but what's the use?' and thus taking up his mace, the Daitya threw himself forward like an elephant to attack the loudly roaring Lord Nrisimha. As invisible as an insect that has fallen into a fire, the Asura disappeared in the effulgence of Nrisimha. It was not so astonishing that moment, considering the fact that He formerly, by the effulgence of His goodness, had swallowed the darkness [of the entire creation]. 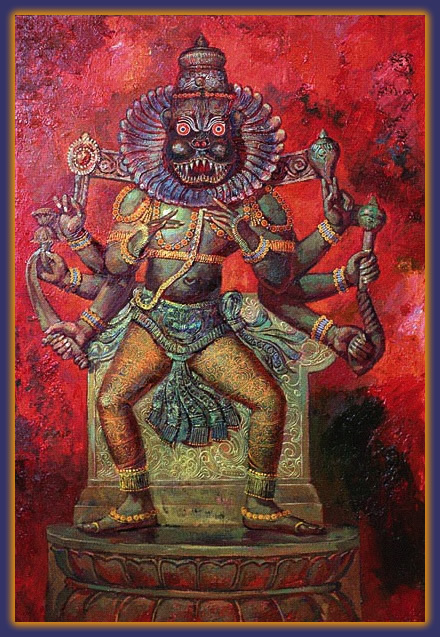 The greatest of the demons reaching Lord Nrisimha thereupon furiously with great force exercising his prowess struck Him with his club, but the Lord, the Wielder of the Club, seized him just like the son of Târkshya [Garuda] would capture a great snake. Oh son of Bharata, when He, in order to play a game, allowed the Asura to slip from His hands, exactly the way Garuda sometimes deals with a snake, the godly souls of the different worlds, who were driven from their positions, from behind the clouds considered that a bad turn of events. The demon, thinking that He had let him go out of fear for his display of power, after regaining his strength, took up his sword and shield and with great force again attacked Nrisimhadeva. When he, with his moon spotted shield and sword, as fast as a hawk was maneuvering up and down, so as not to offer any opportunity, the Lord made a very shrill, loud sound of laughter that was so frightening that he, with his eyes [for a moment] closed, was captured by the Greatest of all Speed. In protest he with his limbs wrestling tried to escape, but the Lord placed him, whose skin could not even be cut by Indra's thunderbolt, at the entrance of the palace on His lap like he was a snake or mouse and pierced him with His nails as easy as Garuda pierces a poisonous viper. With His most fearful eyes full of anger He was difficult to behold. With His mouth wide open licking the edges with His tongue and with His mane and face smeared red with traces of blood, He wore the intestines like a garland around His neck and looked like a lion that just has killed an elephant. The heart He with His pointed nails had ripped out completely and thrown aside and the thousands of followers, who with their raised weapons attended to their leader, He all killed using His nails and the other weapons in His countless hands. Shaking His manes He scattered the clouds and with His glaring glance He outshone the luminaries. The waters and oceans, struck by His breathing, swirled in perturbation and afraid of His roar the elephants guarding the quarters [of the universe] cried. With Him tossing His hair, the celestial chariots crowding in the sky were shoved from their places, the earth shook under the heavy weight of His feet, His intolerable force moved the mountains and hills and His effulgence outshone everything else in all directions of the sky. Thereafter sitting in the assembly hall on the highest seat of man with a most fearsome, terrible countenance, there was no one to challenge Him nor anyone to worship Him. But upon hearing how he, the Daitya who was the headache of the three worlds, in the battle had been killed by the Lord, there were exclamations of joy, blossoming faces and endless showers of flowers from the wives of the demigods. At that time there was an overcast formed by all the celestial chariots of the demigods desirous to attend. Drums and kettle drums were sounded and the greatest singers and angels of heaven sang and danced. All the godly souls, Brahmâ, Indra and S'iva, the sages, the ancestors, the perfected souls, the scientific experts and the great serpents [great egos] assembled there. The founding fathers, the leaders of mankind, the residents of heaven and the best of the angels arrived there too, as did the venerable souls, the keepers of the wealth and the monkey-like, oh my best one. Also the goblins came, the souls of superpower as also they who were Vishnu's personal associates, like Sunanda and Kumuda. With their hands folded before their heads to offer their obeisances, each of them approached Him who had appeared as half a man, half a lion and now sat there on the throne displaying His effulgence. The ancestors [the Pitris] said: 'Of the demon who, engaging with force, enjoyed our s'râddha sacrifices that were offered by our sons and grandsons, of him who, even at the holy bathing places, drank from our offerings of sesame water, You [now] pierced the intestines of his belly with the nails of Your hand and thus have these offerings [finally] reached their proper destination. We offer Him our obeisances, He, the maintainer of the universal principles of religion who appeared as a man-lion. 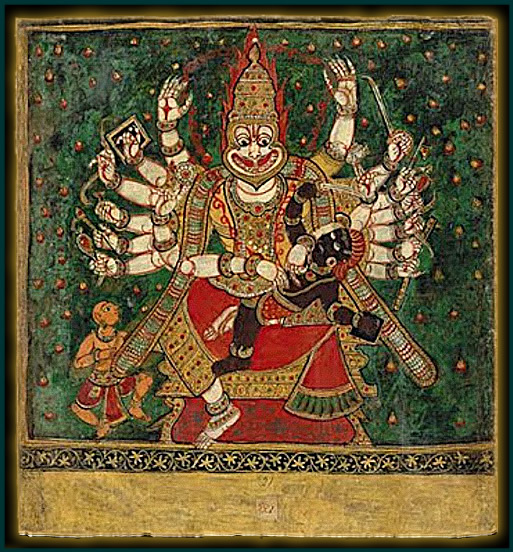 The first picture is a classical painting of Nrisimhadeva slaying the demon king. The second modern painting of Nrisimhadeva is of Johannes Ptok (Janmanalaya). 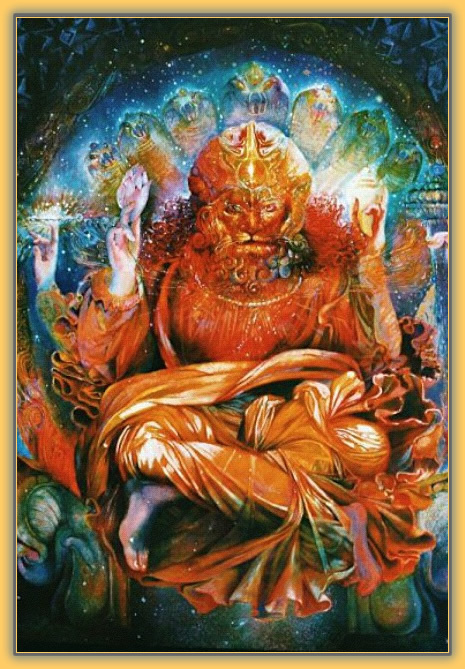 The third picture is a painting of a murti of Nrisimhadeva by Vlad Holst. Used with permission.